I like to take my kids away somewhere for autumn half term holidays and what could be better than mixing relaxation with a little botanical study? I’m sure my two lads would have an opinion on that, but we’re not asking them are we? So, for October 2006 just a week was spent traversing the High Atlas and Anti Atlas mountains of Morocco. As usual a hire car allowed us to cover some good distances and to see many different habitats. Starting in the city of Marrakesh we headed straight for the High Atlas range which is clearly visible across the plain to the south east as one breaks free of the conurbation. The ground was very dry, here and for our whole trip, as rains had not returned yet after the long hot summer. I was looking forward to seeing the beautiful blue leaved version of the European dwarf fan palm, Chamaerops humilis var. cerifera, which is endemic to Morocco. I knew it occurred in certain areas but wasn’t sure whether or not we’d be lucky enough to bump into it. We soon found some healthy clumps, but nothing could prepare me for just how common this species was. We literally saw hundreds of thousands, if not millions of plants, regularly and throughout the whole trip. On arrival at our first stop for the night, in the foothills of the High Atlas, we found the local cemetery was populated by a superb colony of the palm, protected from grazing and interference by high walls and locked gates. Whilst most of the Chamaerops we were to see were usually kept virtually trunkless by animals and humans, these noble specimens were growing as nature intended on trunks up to about 4m high; a fascinating insight into how the excessively overgrazed hills might look without the goats. 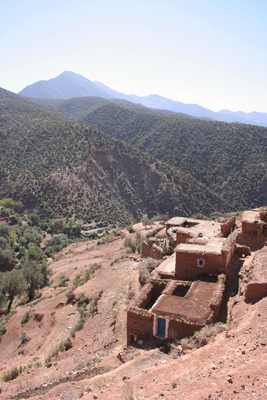 We explored the local area the next day with the help of a Berber guide, Ahmed, who took us on a trek to a remote Berber village with no road access. On the way through the Cistus and lavender scrub covered hills he demonstrated how he made twine or cord from plaited segments of Chamaerops fronds. Lunch was served on the roof of one of the village mud-brick houses, which of course came with Moroccan style mint tea; a mass of freshly picked leaves stuffed into the teapot, poured from a good height, and plenty of sugar. During our walk we passed through extensive stands of scrubby oak forest and occasionally across dry cultivated fields with great sheets of clonally distinct Chamaerops with subtly different leaf colours. Sometimes these great, wide, but extremely low clumps were up to 8m across. The next day took us over the Tizi n ‘Test pass, with all our might conquering the mighty High Atlas (it’s so easy in a car). En route we passed through open woods of a native conifer and Cupressus relative with a good name, Tetraclinis articulata. 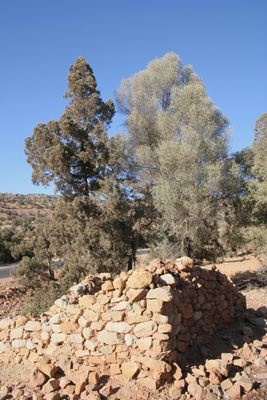 This endangered conifer mainly grows in Morocco, N Algeria and N Tunisia, but also occurs in very small relict populations on Malta and in southern Spain, and perhaps in Libya. We also passed wild stands of the tightly endemic Moroccan, Cupressus atlantica, which is not so distantly related to the ‘Italian’ cypress, Cupressus sempervirens, before coming across the 12th century, roofless, Mosque de Tin Mal. khaki, green and red-brown were like nothing I had seen before. It wasn’t long before we reached the Tizi n ‘Test pass where the great panorama to the south opened up before us over a low woodland of Quercus rotundifolia, a very close relative of the Holm oak, Q. ilex. The altitude at the pass isn’t too exceptional, at only 2092m, at least compared to the height of Djebel Toubkal at 4167m, though I was pleased to see the Chamaerops was still with us, indicating at least a certain amount of hardiness. After a spectacular drop off the mountains to the floor of the Souss valley we were there surrounded by countless thousands up wild yet cultivated Argan trees, Argania spinosa. This very drought tolerant little tree is very much a speciality of the area as they are actually unique and endemic to this valley and coastal areas nearby. By crushing their nuts the locals produce Argan oil, one of the finest culinary oils in the world. 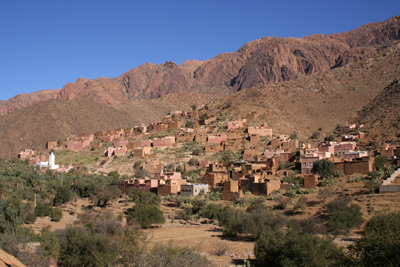 After a night in Taroudannt we headed for the Anti Atlas mountains, further to the south. 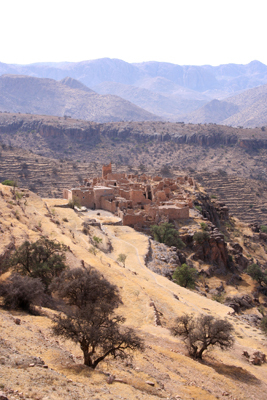 The landscape became ever more spectacular, with abandoned or semi-abandoned ancient villages peppering the barren but beautiful slopes and valleys. We were now not far from the extremely small population of the mainland form of the Macaronesian Dragon tree, Draceana draco subsp. ajgal. This was only described in 1996 as a distinct entity. Finding a way to get close to the plants was altogether another matter and we had to be happy with a magnificent view of the canyon in which they grew and to be able to just pick them out on the cliffs with binoculars. The date palms growing in the river valleys in this area are subject to speculation about their possible ‘wildness’ being smaller in all their parts than cultivated plants and with the fruit lacking in flesh and not particularly edible. The leaves are a good uniform blue green. ’twas time to leave the glorious pink rocks of the Anti Atlas and head north to the Ida Outanane, where we would find the endemic wild Moroccan olive, Olea europaea subsp. maroccana which occurs in just a few small areas of the country. The foliage on this rare form is very slim and often rather silvery-beige-green. This is quite incredible. You barely ever see Chamaerops that tall in their natural habitat, not even the common green Chamaerops, which grows all over the Western Mediterranean, it usually looks like a little bush with no visible trunk. What was the name of the first village with the cemetery? Can you post higher resolution pictures? The large Chamaerops were in the cemetery in Asni, south of Marrakesh. I have seen trunked Chamaerops in other areas, but never as tall as these, at least not outside gardens.